When management decided to purchase and install a new, vented lead-acid battery system at the Dogwood power plant, decision-makers also investigated the benefits of adding a continuous battery monitoring system. The reasoning behind the research was simple: In spite of the battery’s static presence in the plant, and (hopefully) infrequent use, power plant battery systems require a great deal of labor to monitor and test. But monitoring and testing are necessary due to the critical importance of battery systems when an emergency situation arises. 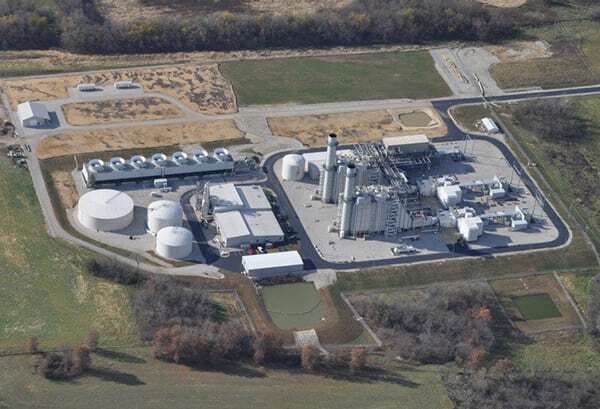 The Dogwood facility (Figure 1) is a 655-MW natural gas-fired, combined cycle plant located in Pleasant Hill, Mo., near Kansas City. It is equipped with two Siemens-Westinghouse 501FD2 combustion turbines and one Toshiba T6065 steam turbine. Through its operator, NAES Corp., owner Kelson Holdings has undertaken this and several other initiatives to enhance reliability, such as installing generator flux probes to improve predictive maintenance capability and adding a secondary plant historian to consolidate data from four different control systems and streamline sampling and analysis. 1. Dogwood power facility. The 655-MW combined cycle plant is located in Pleasant Hill, Mo., near Kansas City. Courtesy: NAES Corp. 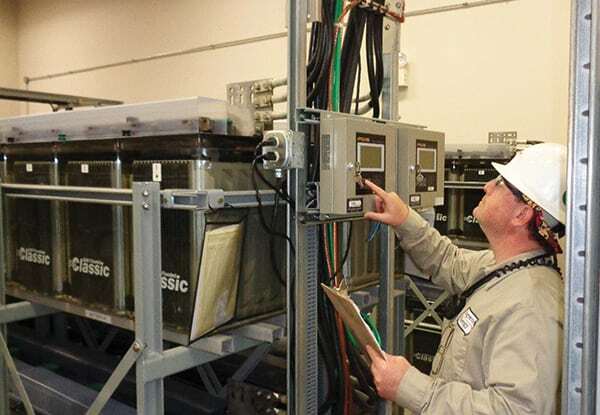 Given the amount of monitoring and testing that batteries require, it’s no surprise that the work gets heavily scrutinized during North American Electric Reliability Corp. (NERC) audits: It’s an easy target for violation. Few other pieces of equipment demand so much monitoring and testing or involve such a wide array of requirements and intervals. Dogwood operators were required to take voltage readings manually on the entire battery bank at the positive and negative terminals of the first and 60th cells. In practice, the work involved a considerable stretch to place probes at the two locations (Figure 2). Using a permanently installed monitor would allow operators to collect this metric at one convenient location with less risk and less potential for error. 2. Tight squeeze. Maintenance Coordinator Glenn Brons demonstrates how difficult it was to test bank voltage before the new battery-monitoring system was installed. Courtesy: NAES Corp.
Like many power plants, Dogwood has a stacked and offset battery arrangement, with the upper row set above and stepped back from the lower set. Frequently, a ladder was needed to reach over and across the lower row of cells, and this was required for each of 30 individual cells per row of staggered cells. Any time a worker must deal with the individual cells of the battery, there’s a possibility of creating a short circuit in a cell or range of cells if contact is made with the battery posts. A battery monitoring system would eliminate this hazard by displaying the voltage of each cell at one location for each of the two banks. While full-time monitoring would provide the great convenience of collecting bank voltage, cell voltage, float amps, and cell temperature at one convenient location, management needed more than simply convenience to justify the installation of a new monitoring system. What the group found was the confluence of convenience with a number of major safety improvements that could be realized. Performing maintenance on a vented lead-acid battery requires taking frequent specific gravity readings. This means dealing with the electrolyte, which is an acid that can cause serious harm. Although Dogwood’s staff routinely wore all of the proper protective gear, the job was still a high-risk activity. Dogwood’s owners made a point of procuring a monitoring system that would in fact monitor the float current. Because the plant’s batteries are lead calcium, the system would preclude the need to perform regular testing of the electrolyte and thus eliminate exposure to the chemical hazard. As mentioned, it would also reduce the possibility of creating an induced short in the battery system by eliminating the need to reach over cells during testing. Another benefit, besides the sheer convenience, would be the increased efficiency of collecting data. Operators could simply go to the monitor (Figure 3) and collect bank voltage, each cell voltage, representative cell temperatures, and float amperage at one location and in just a couple of minutes—roughly the same amount of time it took to visit one individual cell, collect a reading, and record that value. This would free up a substantial amount of time to conduct other plant activities. The reduction in time needed to perform specific gravity readings reduced the time spent doing preventive maintenance on batteries even more. 3. What’s not to like? The new battery-monitoring system allows staff to check individual cell voltages, temperatures, and other metrics at a glance, as well as collect and report data with ease—all with less risk of short circuits or exposure to chemical hazards. Courtesy: NAES Corp. The monitoring system would also allow operators to download data for regular trending and reporting over longer periods of time. Parameters could be established so that once a given setpoint was reached, an alarm would activate, indicating an immediate problem. Depending on the frequency at which plants monitor their batteries manually, an abnormal condition could go undetected for weeks or months without a monitoring system. Once all of the benefits were considered, Dogwood’s owners decided that installing a battery management system for the lead acid battery was the right choice. Management selected monitoring systems manufactured by Eagle Eye, Alber, and Cellwatch for comparison. The price and technical capabilities of each system were very similar, and all three were fairly easy to install and integrate into the plant. The group felt that the Eagle Eye system’s operator interface had a slight edge over the others and because it received glowing reviews from references that were contacted, Eagle Eye was chosen. The Eagle Eye iPQMS battery-monitoring system was installed on the plant’s vented lead-acid batteries for the steam turbine system. Dogwood also installed Eagle Eye BQMS monitoring systems—which are very similar to the iPQMS system but without the local display interface—on both of its combustion turbine battery systems. Since the system went online, it has proven to be very effective. The group elected to extend the monitoring capabilities to the control room as well. Although a few communications problems have arisen in the process, the team is confident that they will be satisfactorily resolved very soon. 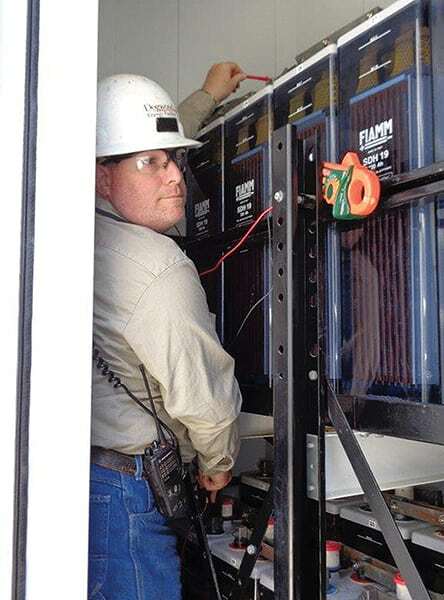 Even though the readings will be made at some distance from the actual batteries, it is Dogwood management’s philosophy that battery monitoring is not a replacement for regular local visual inspections, but rather an enhancement of those activities. Plant staff is still required to perform regular visual checks, although the system has eliminated or minimized the hazards that accompany plant battery testing. If and when the plant needs to rely on its battery system, management feels assured that it will be in a reliable condition to meet the demands of the moment. —Glenn Brons is maintenance coordinator for NAES Corp. at Dogwood Energy in Pleasant Hill, Mo.